Most ebooks were sold protected with DRM, E-book market share leader Amazon has been criticized for using DRM for e-books they sell for the Kindle device, and it appears that Apple will employ the same tactics. 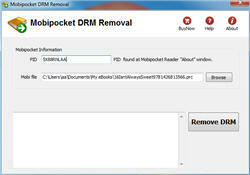 this is tutoral to remove drm from .mobi ebook. 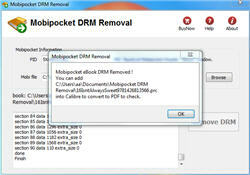 What you need to do is to visit ebook-converter.com, download and install Mobipocket drm removal that is tools to remove drm from mobi ebook. 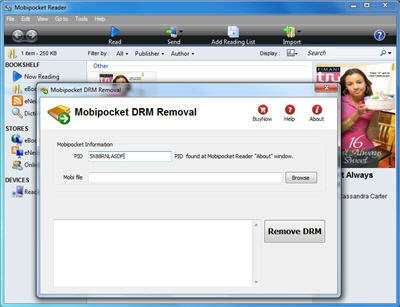 select mobi file to decrypt, you navigate to the folder containing mobi ebook files, it should be in folder “C:\Users\your-name\Documents\My Kindle Content” folder, then you should input PID of Mobipocket reader, you find it at “About” Windows.